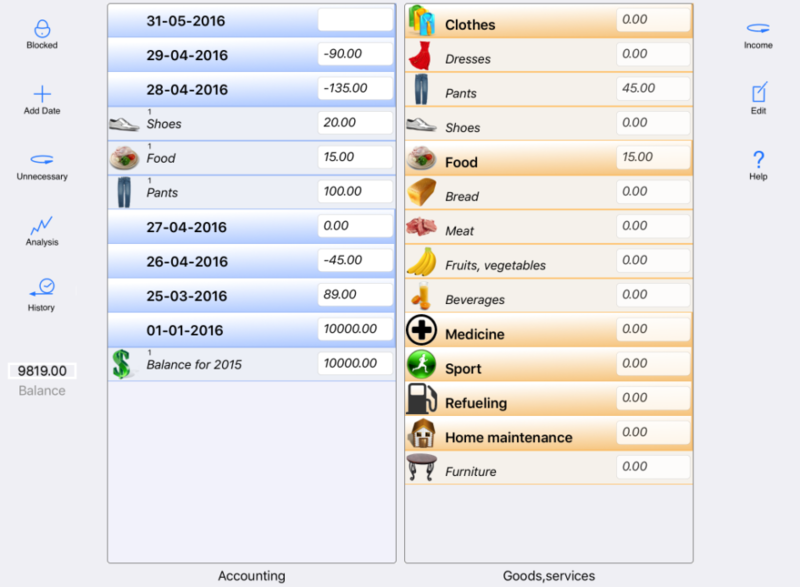 HomeFinance app allows you to keep track of personal income and expenses in a simple way with minimum time spent. 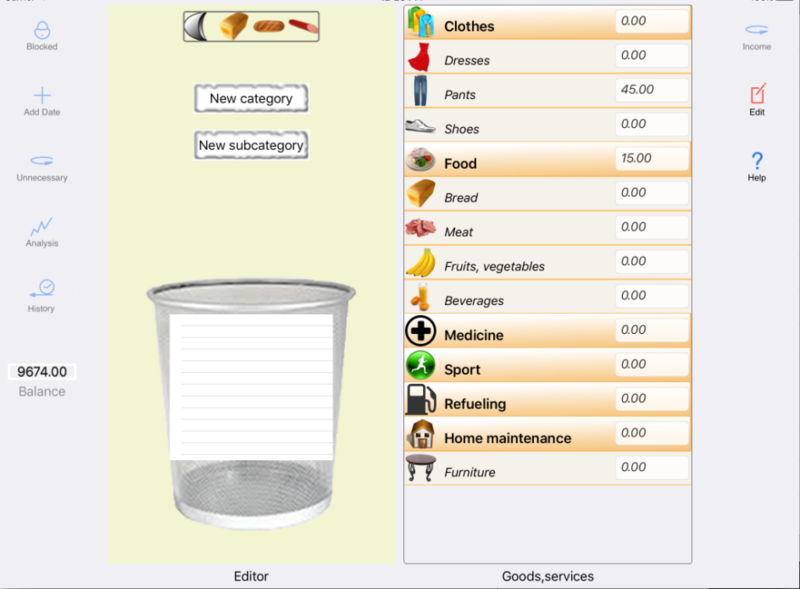 Table on the right side of the screen contains the list of commonly used goods and services combined into categories. Define categories and their contents according to the most frequently used ones. Later, you can view the summarized data on these categories in «Analysis» system. 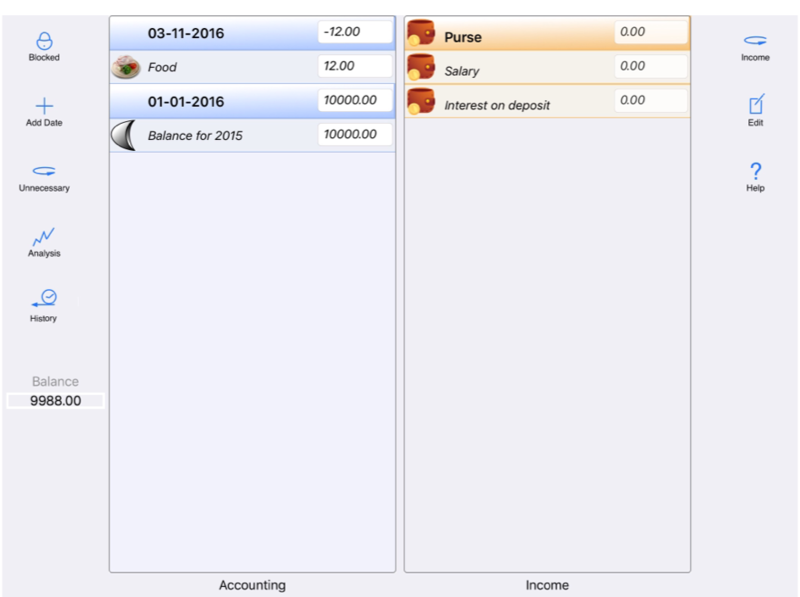 The left table in the main screen is used to store records of goods, services, income by days. Record is made by moving a line from the right table into the left one by icon. Previously you can specify the value of product in that line, or do it after moving on the left side. At the same time, the current balance of the day and the overall balance are updated. You can transfer categories or their subcategories. Later, you can edit the value or name of product in Accounting section. Touching the dates and categories in the tables of the main screen opens their contents. Pinch gestures allows you to fully open and close the contents of these tables. Menu “Blocked” protects previous dates from editing. When moving a purchase, income to an arbitrary place of the left table, the entry will automatically be transferred to the current day. In the “Unblocked” mode moving must be carried to a specific date. 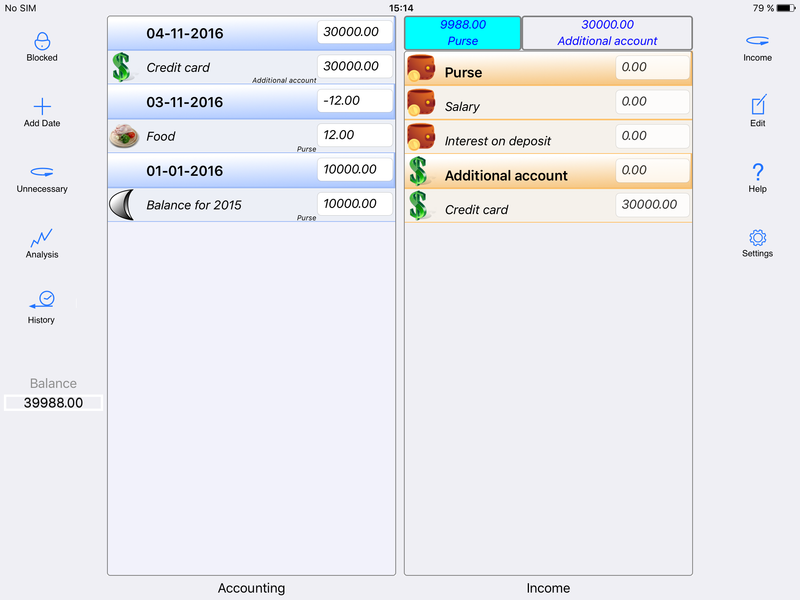 To delete lines in “Accounting” section, move a line outside the table, to the right or to the left. For past days it must be done in the “Unblocked” mode. To add certain date in past use the button “Add Date”. The current date is added automatically. opens table section «Unnecessary». Initially, the table section “Unnecessary” is a complete copy of the “Accounting” section. “Unnecessary” section is used if you want to keep track of “money wasted” on purchases. If you think that certain purchase was unnecessary, just remove the line from the table “Unnecessary”, to the right of the date will appear “=” button, which allows you to align all the records of the day with the records in the Accounting section, i.e. undo changes . “Unnecessary” changes will then be reflected on the graph in “Analysis” section in halftones that are different from the basic color. In case of irrational spending of money, it allows to assess the degree of “irrationality “. “Analysis” menu allows you to view the graph of balance changes, analysis by categories and subcategories with accumulation for year and month. Y-axis is value of balance. X-axis is dates of balance changes. The y-axis maximum value is the maximum value of balance for the year. 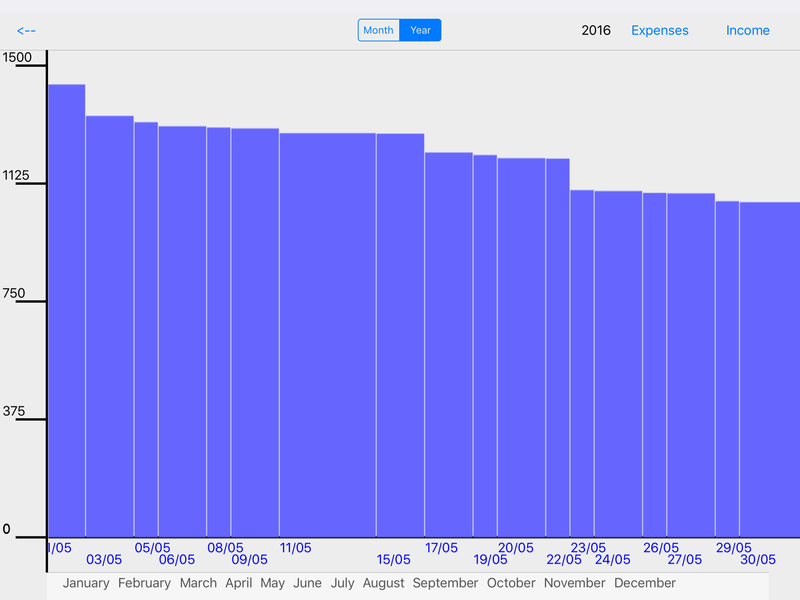 The undertone of the graph indicates what value of balance could be without the «unnecessary» expenses. Touching date on the x-axis displays information on this day. Monthes menu at the bottom of the screen allows you to move the graph to a needed month. 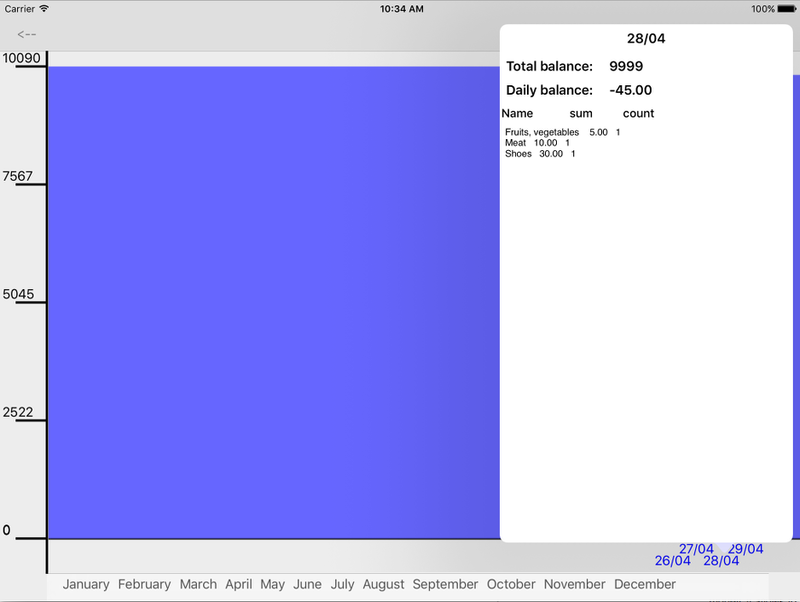 Buttons «Income» and «Expenses» at the top of the screen are to view aggregated data for a year or a month. 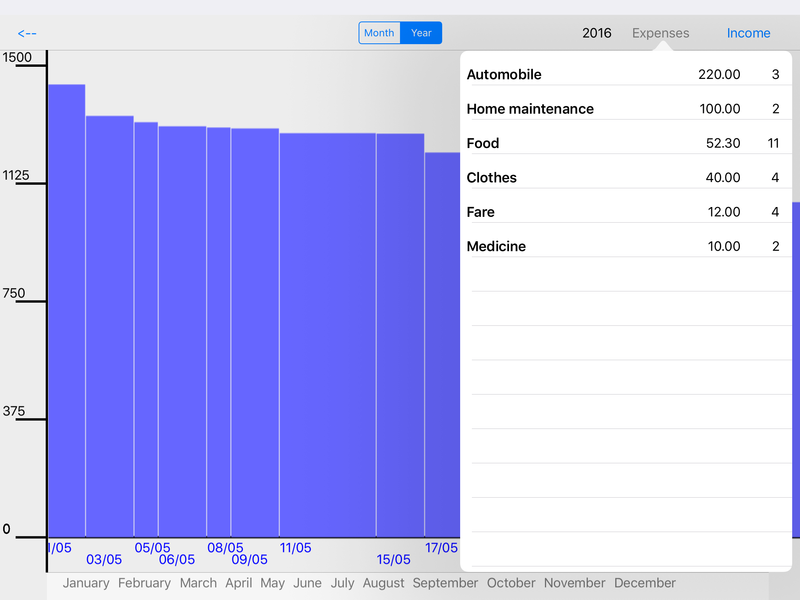 To view the summarized data by categories and subcategories for months, select “Month” segment, select the month at the bottom of the screen and choose from the menu “Income” or “Expenses”. Touching a category opens its content. in the main screen allows to choose and view data for past years. It is not allowed to edit this data. You can only view and analyze it in the «Analysis» system. allows to change between «Goods,services» and «Income» sections. А record from the «Incomе» section increases balance. 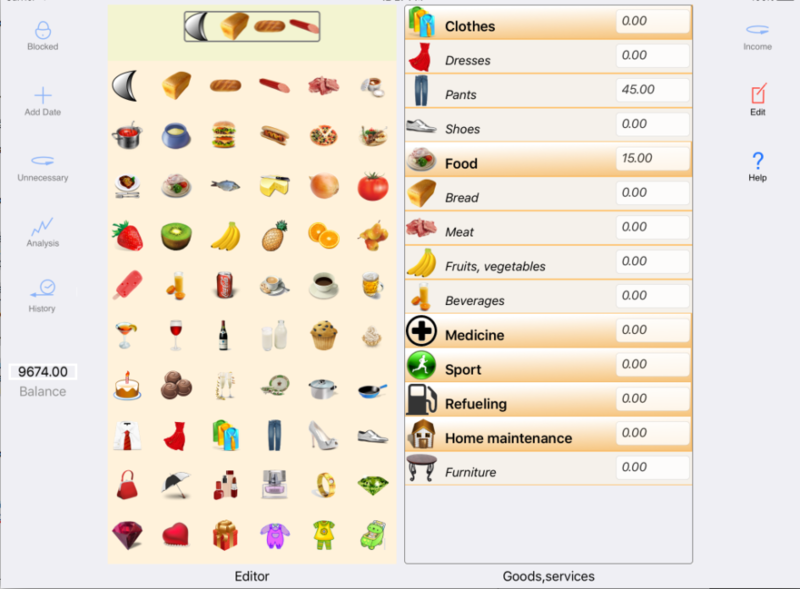 allows to edit the tables «Goods,services» and «Income». You can add and remove categories, subcategories, change names and link images to a line via the “Editor” menu. Moving in the “Editor” “New category” and “New subcategory” marks to the table creates a new category and subcategory. You can delete individual lines and entire categories by moving them to recycle bin. As long as you have not closed the “Editor”, you can restore lines by moving them to the initial or new location from recycle bin. If a category or subcategory created in the right table has already been used to account for purchases in the “Accounting” section, it becomes impossible to remove such category in the “Editor”. This does not apply to subcategories. At the top of the “Editor” there is button «Icons» . It opens images table. Icon for a line can be assigned by moving icon from this images table. The app supports the management of multiple accounts. Category in the Income section is account. When you create more than one category there are segments to select account. And the records about purchases will be attached to the selected account.